Here are tips to make sure you're storing silver properly, so that it has little chance of damage and minimal tarnishing between uses. Just like with the china I want us to all enjoy our silver possessions we own. That means you shouldn't tuck these things away out of easy reach. 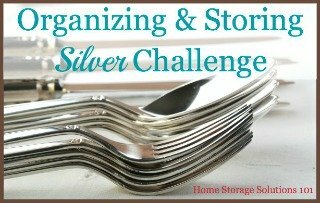 On the other hand, it is unrealistic to think we'll use our fine silver items every single day so here are the rules for storage so when you get your silver items out they won't be damaged or too blackened from tarnish. When someone says they've got silver sulfide on their silverware or other silver items it's just a fancy way to say "tarnish." Tarnish is the black film that develops on your silver over time and makes it yucky looking instead of shiny and beautiful. You can't wash tarnish off with soap and water, since it is actually caused by a chemical reaction between the silver and sulfur, or sulfur containing substances such as air, water, wool, felt and rubber, for instance. However, you don't actually want to polish silver very often for several reasons, including that it's no fun to do, and because whenever you polish silver it takes a little of the silver off so you only want to do it when necessary, at maximum 1-2 per year. Pure silver is an element, and it is a soft metal. To make it harder even sterling silver, which is 92.5% pure silver, has another harder metal combined with it (typically copper) to make it harder. Since silver can easily get scratched or dented you have to handle it with care. That includes storing it so that items don't bang into one another while they're in storage. Did you know that humid air and heat both hasten tarnishing? Therefore, make sure you're storing silver in an area of your home which does not suffer from heat fluctations, and also is not too humid. A good storage place would be in a drawer in a hutch or china cabinet, as opposed to a wet basement or hot attic. Not only is your china cabinet not too humid or hot, but it makes it convenient to access your silver (and china) when you want to use them for special occasions. You should place your silver in flannel bags or in chests lined with treated flannel cloths. Such flannel has been treated with silver nitrate or other chemicals which help retard tarnishing. Several different types of these storage containers are available. 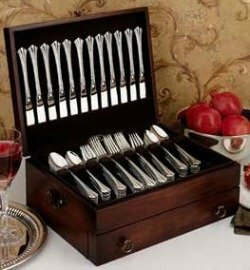 For silverware you can choose either a bag with lots of little slots to place the silver (so it doesn't clatter against each other and scratch) or a chest. 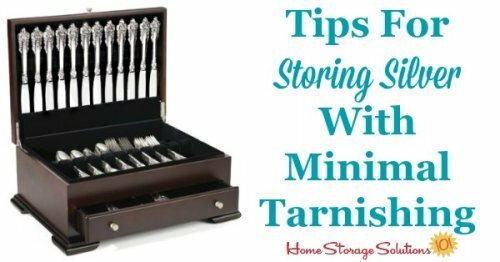 Make sure to choose something that will fit inside your china cabinet or other area where you'll store it, and hold all the place settings of silverware that you need to store. There are also various sized bags available for storing larger silver items, like trays, bowls, etc. that you may use. Take an inventory of your silver items and use the appropriate sized bags for what you own. 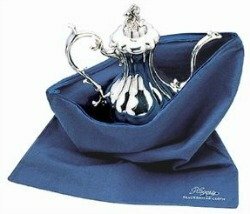 Storing silver in these treated flannel bags or cloth will not prevent you from having to polish your silver ever again, but it will lessen the need for polishing because less tarnish will develop. 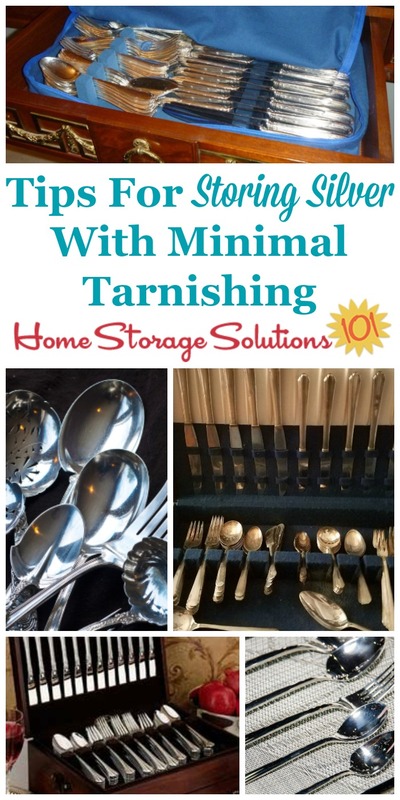 Helpful hint: It is perfectly fine to store tarnished silver without polishing it first. I would suggest that if you have tarnished silver and then you get these bags or chest, just store them tarnished, for now. Just plan to take time to polish them up before you use them again (at most about a year from now), and then replace them back polished next time. That saves you from polishing, storing and then having to potentially touch up your polishing again before use the next time. If you don't want to use these flannel anti-tarnish bags for storing silver you can also store your silver wrapped up in archival quality tissue paper, in an acid-free box. You want to make sure you don't get acidic paper (and don't use newspaper) because the acids or ink can damage, pit and corrode your silver. You should avoid storing your silver wrapped in newspaper for the reasons stated above, the ink is acidic and can harm your silver. In addition, although air and humidity cause tarnish it is not a good idea to store your silver in plastic bags. The reason is that the bags can trap moisture within them which actually can accelerate tarnishing, and also cause pitting. Finally, don't use rubber bands to hold together your silverware, since the rubber contains sulfur which causes excessive tarnishing and other damage to the surface of the silver. I suggest that you keep your silver stored in your flannel bags and chests when not in use to inhibit tarnishing. I don't suggest using wax for storing silver items because then you have to remove wax before you can use it for eating which is a pain, and therefore impractical. 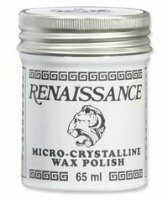 The only items I would suggest waxing (with a micro-crystalline wax such as Rennaissance Wax, see picture to the right) would be those non-food silver items you wish to display in your home. In that case once an item is polished, and all tarnished removed, waxing can prevent air and water from reacting with it and tarnishing it again as quickly. Of course, this wax can cause your silver to look more dull, so you may just want to polish your display items periodically instead. Another reason though to use them often is because regular use is the best way to prevent tarnish from forming. Make sure you that you wash all items soon after use, since salt and acidic foods can cause damage and pitting, and dry them thoroughly before replacing them back in their storage containers. Finally, be conscious to rotate items through use so all pieces get the benefit of this regular use.